Brien Jones is a predator. He had his staff calling people in nursing homes to solicit them for money. Some of his past employees have called me with the horror stories of how horrible they felt doing this. Children of three different elderly authors have contacted me after their parents died waiting for books that were never printed. […]Some of you are aware that Jones opened a bookstore in a strip mall in the middle of nowhere. Since he was unable to get author books into real bookstores, he rented his own with the money donated by two authors in order to have the store named after them, Bidwell Moore and Merlene Byars. […]I called several stores in the shopping strip where the store was located and they confirmed that Jones “snuck out” in the middle of the night due to non-payment of rent. Brien Jones has given up snookering elderly people out of their savings to "publish" their books to reportedly concentrate on becoming an author himself. I only wish he was writing his books from a prison cell. The real tragedy here is that law enforcement officials in Indiana let Jones continue with his sham publishing company until it finally, and thankfully, crumbled under his staggering incompetence. The books are on sale for just 99 cents. 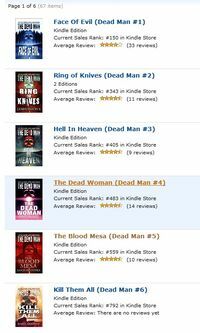 Please buy a copy of one or more of the books and help us put The Dead Man in the top 100! Several years ago, Bill Rabkin and I had the pleasure of adapting Aimee & David Thurlo's terrific Ella Clah novels into a one-hour pilot for CBS. We loved that script, but the network passed us over in favor of Queens Supreme, which was cancelled after just three episodes. In the Thurlos’ satisfying 17th novel featuring Navajo policewoman Ella Clah (after 2010’s Never-Ending-Snake), a remote area near a steep-sided outcrop called Hogback becomes a murder scene with the accidental discovery of a buried body with two bullet holes in the skull. More grave sites in the same area, including one just outside tribal boundaries, make it a multijurisdictional investigation bringing in San Juan County (N.Mex.) sheriff Paul Taylor and FBI agent Dwayne Blalock. Tracking the victims, some dead for several years, complicates the investigation. An attempt to get rid of a possible witness, a young boy playing near Hogback, heats the action. Meanwhile, Ella must deal with the needs of her teenage daughter, Dawn; mother, Rose Destea; and romantic interest, Rev. Ford Tome. Navajos known as the Fierce Ones threaten to worsen the situation with vigilante justice in this insightful portrait of a native culture still evolving between tradition and modernity. The Thurlos are among the most prolific authors I know — I think they're juggling three book series now — and they always deliver a great read. Do yourself a favor and grab this book! Today while searching good link partner to my website I came across through your great website And willing to exchange link with your quality site. As you know reciprocal linking is very useful for high ranking on Google. If you have any query please do not hesitate to contact me! Waiting for your quick an positive reply. The links were all to bootleg video sites for episodes of Battlestar Galatica, Babylon Five, Charmed and other SF shows. Clearly, English is not this guy's first language. And the only thing dumber than asking me to link to a bootleg video site would be to link to one bootlegging my shows. And guess what? He did that, too. The dimwit. Twice in the last two days I've received automated calls from Global Telelink Advance Pay Authorization Payment Services asking me if I would accept collect calls from the Pritchess Detention Center, East Facility. Obviously, I hung up…but I have to wonder, how did those prisoners get my number and what makes them think I'd let them make calls on my account? The Dead Man is Alive! Amazon re-launched THE DEAD MAN series an hour ago…and with it, their 47North imprint. They are pricing the books at 99 cents for a very limited time. You can read all about the creation & writing of the series today on the Amazon Kindle Post blog and on the product page for Face of Evil. 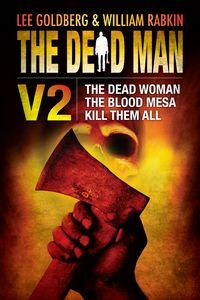 In addition, there are interviews with each of the individual authors on the product pages for Ring of Knives, The Dead Woman, and Blood Mesa.